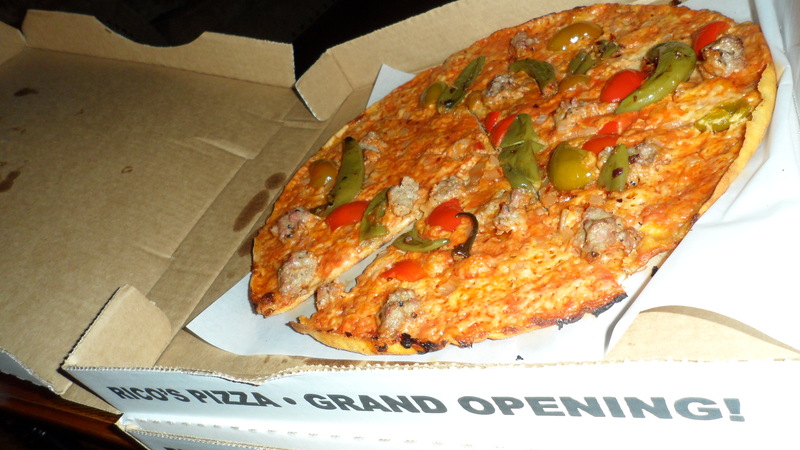 Now, to get the pwn vs. n00b comparison review, we ordered the same exact pizzas that we had at Colony. Pie 1: Sausage, hot oil, stingers, cherry peppers, and onions. 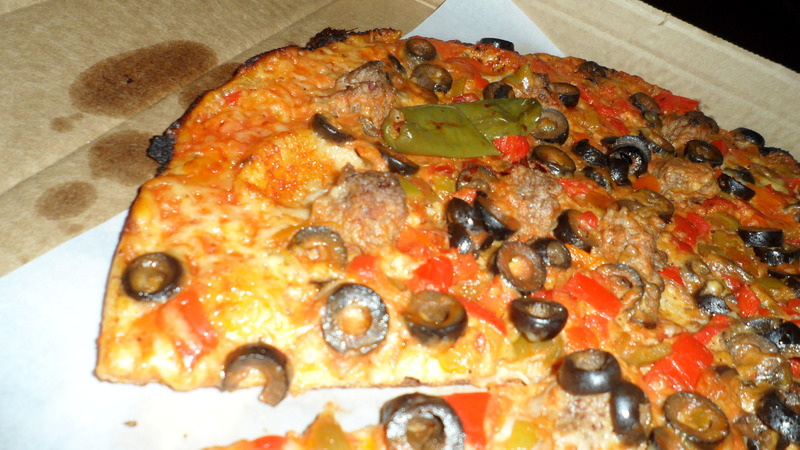 Pie 2: Meatball, peppers, hot oil, and black olives. The first thing that we noticed was that the cheese-to-sauce ratio was off. It was barely there, and what sauce was there was killed by all the cheese. In fact, the cheese was so loaded up on the pies it made weird pock-like lumps. Colony had similar bubbles, but Rico’s are way more pronounced and solid. All in all, Colony’s pie had a better ratio with definitely more sauce and not too much cheese. but unlike Colony’s, the hot oil made the pizza soggy and floppy. It’s kind of weird, but Colony’s pie was drowning in hot oil, yet stayed crisp. Rico’s is good, but not great. You can’t go in here expecting a pie just like Colony because there are noticeable differences. We know that we don’t want to be pizza fascits (remember the signs? ), but it was just okay. Service, in terms of delivery and experience, was far below what anyone would expect from delivery. They do get some extra points, though, for also having wedges, wraps, salads, and empanadas. Empanadas? Yeah, weird, we know. We’d love to give it another go by stopping by and getting a pie right out of the oven, but for now we’d rather head to ZAZA, Remo’s, Capriccio, Colony, Tappo, or Coalhouse Pizza. Atlantic did not change hands, but they had some issues that i was involved with and then they renovated big time and probably did change some people, all of which would have been to the good. They did let John take customers while they were renovating and visa versa when he was. also like Outback,plan to eat there this week. Also hope to catch the Connecticut Restaurant Week and Cafe OOhLaLa!!! I will have comments about these eateries. place until they exchanged ownership and changed the recipe. Please forgive me but what do you mean about faces?? Ricos need to stop burning up their pizzas!!! I always thought the customer comes first…obviously not!!! They wont be open much longer if they keep those ethics up!!! I’d be upset like you if I waited to get my pizza and it was burnt. Here’s the problem: thin crust. It takes a great pizzaioli to work the oven, shift the pizzas, and keep it in for just the right amount of time. Too much and it gets burnt like that. So, either the pizza chef is inexperienced or just snoozed off. But, you’d think you’d take some pride in your work and fire up a new one. There’s gotta be someone at the pass, I learned from Kitchen Nightmares and Hell’s Kitchen, who handles the quality control. :( Sorry you got burnt pizza. Yeah, hate that feeling of regret…like you’ve been taken advantage of. I like to give some places second and sometimes third chances, but if it keeps happening you’ve got plenty of other great places to go. We’re littered with great pizza here in Stamford. What are your faves? Colony doesn’t deliver, and only takes cash. Colony’s wait to be seated is typically well over an hou, and can never find a parking spot. There are virtually no differences between rico’s and colony’so other than that. It’s funny. When we went to Colony to write our review, we found a spot right outside and we were seated right away. Guess we were just lucky. :) What makes you say the pizzas are the same? One more quick thing on Pizza – New Pizza resaurant on Altlantic (as if Atlantic needed a new pizza restaurant up next to the former aApple cafe (does that show age???). I had heard of the spat before it hit the papers. Apparently Ricco’s is making a big hit with the traaes people in this town. So after your post, i had to try. Now it has been a while since having colony pizza (not my favorite in this town of so much good pizza) and so i am going by memory (which also is not that good. Otherwise the others ordered a plain and raved about it…something about a crisp crust really gets them going. Cheap – yes. Would i do it again – yes. Glad to hear your trusted take on the subject! Sounds like either Colony or Rico’s is a good choice, but Colony has the edge and I’d say, the track record. I do wish Rico’s the best, because I like to see any person succeed, but couldn’t they have at least changed the pizza in some way so it didn’t look like total copying? I hear ya… they could be less obvious ! We actually were talking about you last night at Napa & Co. And how we all miss your entries. :) Also, thanks for the kind words. You rock. I think Rico’s became a victim of its own success. (Maybe this was the ulterior motive for the lawsuit, to overwhelm Rico’s in an attempt to destroy its reputation?) You didn’t mention that Rico’s has taken out an ad apologizing and promising additional ovens and deliverers to cope with the demand. We got a takeout pie late on a Friday, thought it was delish, pretty much identical to Colony, and best of all, it came without the attitude, grunge, and cash-only nonsense. Can’t see any reason to deal with Colony ever again. I prefer Remo’s myself, but when the urge hits for a Colony style pie, we’ll get it at Rico’s. Maybe this will be a wake-up call to Colony that the customer matters.